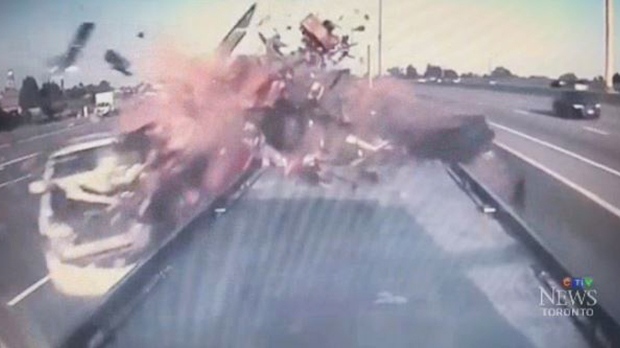 Tires and debris flew into the air following a collision on a busy highway in Toronto – and the entire thing was captured on video. The footage was recorded Saturday night by a dashcam attached to Adil Kanan’s tow truck. Kanan had been called to Highway 401 near Port Union Road to help deal with a disabled pickup truck. When Kanan arrived at the scene, he found a woman in the driver’s seat of the truck, a man in the front passenger seat, and another man standing outside the vehicle. 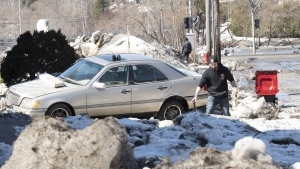 “They seemed to be all alert and fine,” he told CTV Toronto. Kanan then went back to his truck to alert police that he and the pickup truck were blocking one westbound lane of the highway. “As I was sitting there looking through my back window, that’s when I observed the white Lexus approaching at a high rate of speed,” he said. The white vehicle then hit the pickup truck, causing significant damage. The man who had been standing outside the truck was thrown into the guardrail. The two people inside the truck were ejected, and the driver ended up face-down on the highway. All three were listed in stable condition as of Sunday night. A dashcam attached to Adil Kanan’s tow truck captured a devastating crash on Highway 401 in Toronto.